Grinding (or milling) grain was an important activity that took place in nearly every ancient Egyptian home. Grinding was necessary to process emmer or barley grain into flour, and thus was a key step in manufacturing bread, the most important food in ancient Egypt. Grinding in ancient Egypt is well-attested archaeologically, and is the most commonly depicted activity of the grain processing sequence in Egyptian art and texts. Indeed, it was the step that likely took the most time and labour. Despite their significance to daily life in ancient Egypt, grinding implements and activities have often been ignored in archaeological reports and historical studies. However, recent investigations of contemporary ancient cultures as well as modern ethnographic work has brought grind stones and grinding to the fore. This has resulted in new archaeological and ethnographic information, and has refined theories regarding grain grinding and those who performed it. Using this cross-cultural body of evidence and theoretical discussion as a starting point, this presentation will investigate grinding in the domestic, non-elite sphere of New Kingdom Egypt. 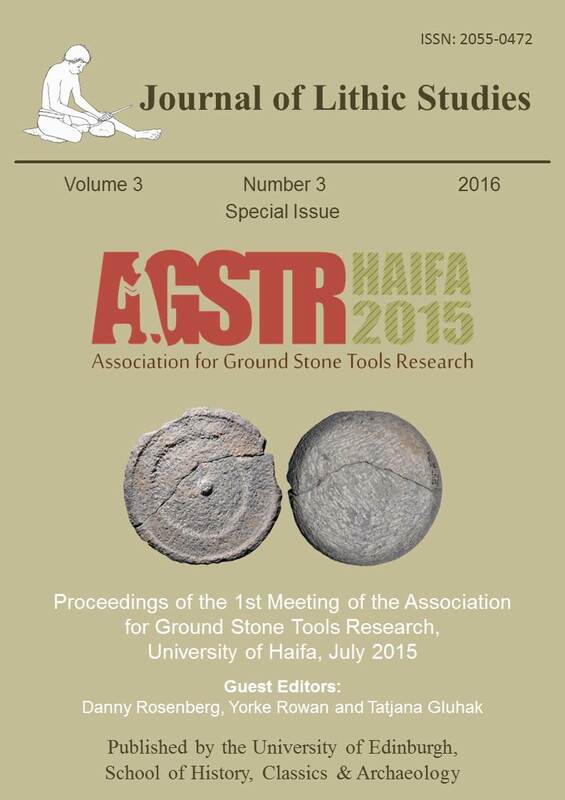 Using the grinding quern as a focus, this study will explore how association with a grind stone, as well as the act of grinding, created or impacted the miller’s identity and contributed to their role in the household. Archaeological data, 2D and 3D artistic representations of grinding, and literary and non-literary texts discussing grinding will be examined in conversation with evidence from other cultures. This paper will argue that grinding grain was particularly associated with females, and was a low-prestige activity. However, it was an important maintenance activity in the household, and contributed significantly to the labour force and economy of New Kingdom Egypt. Asher, M. 1986, A Desert Dies. Viking, Harmondsworth, Middlesex, 330 p.
Austin, A. 2014, Contending with Illness in Ancient Egypt: A Textual and Osteological Study of Health Care at Deir el-Medina. PhD Dissertation, University of California, Los Angeles, 301 p.
Breasted, J. H. 1948, Egyptian Servant Statues. Pantheon Books, New York, 113 p.
Brumfiel, E. 1991, Weaving and cooking: Women’s production in Aztec Mexico. In: Engendering Archaeology: Women and Prehistory, (Gero, J. M., & Conkey, M. W., Eds. ), Basil Blackwell, Ltd., Oxford: p. 224-251. Černý, J. 1973, A Community of Workmen at Thebes in the Ramesside Period. Institut Français d'Archéologie Orientale, Cairo, 383 p.
Cooney, J. 1965, Amarna Reliefs from Hermopolis in American Collections. The Brooklyn Museum, Brooklyn, 110 p.
Davies, N. de G. 1920, The Tomb of Antefoker, Vizier of Sesostris I, and of His Wife, Senet (No. 60). George Allen & Unwin, Ltd., London, 40 p.
Enmarch, R. 2008, A World Upturned: Commentary on and Analysis of The Dialogue of Ipuwer and the Lord of All. Oxford University Press, Oxford, 294 p.
Foxhall, L., & Forbes, H. A. 1982, Sitometria: The role of grain as a staple food in Classical Antiquity. Chiron, 12: 41-90. González-Marcén, P., Montón-Subías, S., & Picanzo, M. 2008, Towards an archaeology of maintenance activities. In: Engendering Social Dynamics: The Archaeology of Maintenance Activities, (Montón-Subías, S., & Sánchez-Romero, M., Eds. ), Archaeopress, Oxford: p. 3-8. Hudáková, L. 2013, Innovative power of Middle Kingdom tomb decoration as reflected in the scenes of grain processing, bread-making, and brewing. In: Florilegium Aegyptiacum: eine wissenschaftliche Blütenlese von Schülern und Freunden für Helmut Satzinger zum 75. Geburtstag am 21. Jänner 2013, (Budka, J., Gundacker, R., Pieke, G., & Satzinger, H., Eds. ), Seminar für Ägyptologie und Koptologie der Georg-August-Universität, Göttingen, p. 159-188. Janssen, J. J. 1997, Village Varia: Ten Studies on the History and Administration of Deir el-Medina. Nederlands Instituut voor het Nabije Oosten, Leiden, 192 p.
Kemp, B. 1984, Amarna Reports I. The Egypt Exploration Society, 3 Doughty Mews, London, 211 p.
Kemp, B. 1986, Amarna Reports III. The Egypt Exploration Society, 3 Doughty Mews, London, 212 p.
Kemp, B. 1987, Amarna Reports IV. The Egypt Exploration Society, 3 Doughty Mews, London, 167 p.
Kemp, B., Samuel, D., & Luff, R. 1994, Food for an Ancient Egyptian city: Tell el-Amarna. In: Whither Environmental Archaeology? (Luff, R., & Rowley-Conwy, P., Eds. ), Oxbow Books, Oxford: p. 133-170. Livingstone, D., & Livingstone, C. 1866, Narrative of an Expedition to the Zambesi and its Tributaries: and of the Discovery of the Lakes Shirwa and Nyassa, 1858-1864. Harper & Brothers, New York, 638 p.
Onstine, S. 2011, University of Memphis Mission to Theban Tomb 16: The life of Panehsy, chanter and priest. Journal of the American Research Center in Egypt, 47: 231-236. Parkinson, R. B. 1991, Voices from Ancient Egypt. An Anthology of Middle Kingdom Writings, British Museum Press, London, 160 p.
Parkinson, R. B. 2012, The Tale of the Eloquent Peasant: A Reader’s Commentary, Widmaier Verlag, Hamburg, 384 p.
Peet, T. E., & Woolley, L. 1923, The City of Akhenaten. Part I. Egypt Exploration Society, London, 176 p.
Postgate, J. N. 1984, Processing of cereals in the cuneiform record. Bulletin on Sumerian Agriculture, 1: 103-113. Rodríguez-Alegría, E. 2012, From grinding corn to dishing out money: A long-term history of cooking in Xaltocan, Mexico. In: The Menial Art of Cooking: Archaeological Studies of Cooking and Food Preparation, (Graff, S. R., & Rodríguez-Alegría, E., Eds. ), University Press of Colorado, Boulder: p. 99-117. Samuel, D. 1994, An Archaeological Study of Baking and Bread in New Kingdom Egypt. PhD Dissertation at Darwin College, University of Cambridge, Cambridge, 343 p.
Samuel, D. 2000, Brewing and baking. In: Ancient Egyptian Materials and Technology (Nicholson, P. T., & Shaw, I., Eds. ), Cambridge University Press, Cambridge: p. 537 576. Samuel, D. 2010, Experimental grinding and ancient Egyptian flour production. In: Beyond the Horizon: Studies in Egyptian Art, Archaeology and History in Honour of Barry J. Kemp, (Ikram, S., & Dodson, A., Eds. ), American University in Cairo Press, Cairo: p. 456-477. Toivari-Viitala, J. 2001, Women at Deir el-Medina: a Study of the Status and Roles of the Female Inhabitants in the Workmen's Community during the Ramesside Period. Nederlands Instituut Voor Het Nabije Oosten, Leiden, 293 p.
Winlock, H. E. 1955, Models of Daily Life in Ancient Egypt. Harvard University Press, Cambridge, 106 p.